The Legacy is 18 holes of championship golf by Arthur Hills featuring numerous bunkers, rolling mounds, large greens and multiple level fairways. A true links design destined to provide a complete golf experience to the player of any ability level. The fairways of the Legacy weave elegantly through the upscale neighborhoods of the master-planned Green Valley community. Outcroppings of native desert landscaping decorate areas in between many of the holes. The practice facility is home to Resort Golf Schools and Academies, one of the top 25 Golf Schools in the country by Golf Magazine. OB Sports offers a frequent player cardholder program at all of its participating facilities. 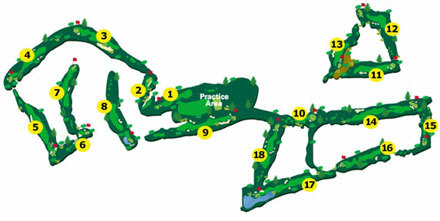 The Legacy annually hosts regional U.S. Open Qualifying and also the American Junior Golf Association’s Las Vegas Founders’ Legacy tournament; the tee boxes on the 10th hole are in the shape of each suit in a deck of cards: spade, club, diamond, heart; full-service banquets, driving range, PGA instruction and golf shop facilities are available.